Speeding at you like an out of control train, XII Boar (pronounced 'Twelve Boar') have been tearing a new one into the stoner/sludge/metal scene over the last few years. The three-piece wrecking ball from Aldershot, Hampshire, blast their way into your skull with ear-splitting leads, sonic riffs, filthy bass lines, whiskey drenched vocals and a sweet southern groove. Combining Motorhead’s swagger, Sabbath’s downtrodden doom and the swinging crunch of Corrosion of Conformity – these Hampshire louts lay down a colossal slab of rock n' roll-infused groove metal that fuels even the greatest parties. With their debut album set to be released early 2015, XII Boar are on track to be unstoppable. Pure rock and roll for the heavier generation. XII Boar (aka Twelve Boar) have slowly been building up their reputation within the UK Sludge/Stoner Metal scene over the last few years now. They’ve released a few releases over the years and they have performed a ton of great gigs. It’s time for XII Boar to release their debut album – Pitworthy. Pitworthy is a hard-rocking, beer-swilling and NOLA-riffing powerhouse of an album that is packed with thrills and spills. XII BOAR come across as the demented offspring of Corrosion Of Conformity, Crowbar and Motorhead jamming for one epic party. 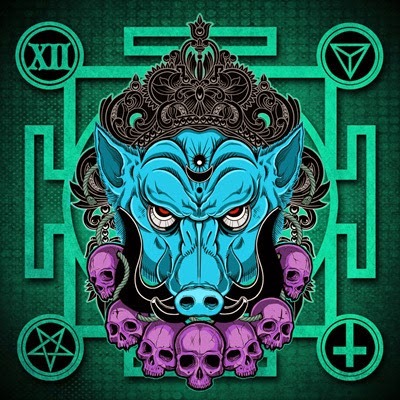 XII Boar revel in rock and roll carnage as this album is one loud, mean and hard-hitting experience that will keep you on the edge of your seat. Second track – Young Man – carries on the Sludge/Stoner vibe from Sharpshooter but XII Boar now start playing a more Blues/Southern Rock groove kind of thing and it’s a dangerous combo with the band playing impressive licks that ZZ Top would be proud to call their own. The vocals have the right amount of swagger and confidence you can’t but help yourself singing along to. XII Boar feel they’ve grown up in the legendary NOLA and Southern Rock scenes instead of the UK as this album is dripping in NOLA/Southern Rock goodness. XII Boar carry on that hard-rocking charm for the majority of the album as they blast their way through a collection of great songs for you to discover. Tracks such as Crushing The P and The Schaeffer Boogie – sees XII Boar venture further into the legendary murky NOLA Swamps with slabs of Southern Groove being used for a more soulful blues-rock ride. The stunning title track – Pitworthy – is one of the albums heaviest tracks as XII Boar go straight for the Sludge Metal jugular with hazy and violent riffs dripping with confidence and purpose. Echoes of Down, COC and Crowbar shine through on this track but XII Boar have this wonderful ability of making this album so fresh and original. Pitworthy is definitely one of the albums standout tracks. Crawdaddy Blues is a 60 second Blues Rock inspired instrumental track that I didn’t feel very much for. The band should have left this track off the album as it brings nothing to the album. It almost kills the mood. Beautifully played though. Don’t worry as XII Boar return to normal business with Chicken Hawk and Battle Boar. Two fast paced hard-rocking numbers that’s sure to get the mosh-pit crowd going whenever they are played live. For the final two songs – Rock City and Quint, XII Boar pull out all the stops for the final 16 minutes of the album. Yeah, that’s right. 16 mins. Rock City sees XII Boar play a more Classic Hard Rock style of riffs and ideas to impress you with. As Rock City matches NOLA based grooves with the heavy sounds of 70s Hard Rock/Metal. The final song – Quint – is an 11 minute epic that may test some listeners patience but stay with it as XII Boar keep you entertained throughout with heavy slabs of Blues Rock, Sludge Metal, Southern Rock, Stoner Metal and Hard Rock all combining for one final action packed ride. Pitworthy is a blistering debut album and one that has the potential to launch XII Boar as one of the UK’s Premier Hard Rock/Sludge Metal bands in the future. Thanks to XII Boar for the promo. Pitworthy will be available to buy on CD on March 9th 2015.